Emerson Stern, fondly known as Sonny, joined the CT ENT team in 2018. A certified American Kennel Club STAR PUPPY, Sonny has become an office favorite among staff and patients. Sonny is currently being trained by Canine Training Expert Susan Grey of Bone-A-Fide Canine Training in Ridgefield to be a Therapy Dog. 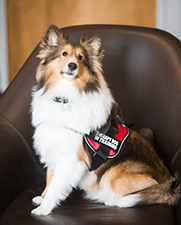 A therapy dog is trained to provide affection and comfort to people in need in many different types of locations and scenarios. Sonny has a friendly, gentle and quiet demeanor. He enjoys human contact and being petted. His favorite past times include napping in a sunny spot in the office, and greeting patients. Though Sonny has helped many patients dealing with anxiety feel calm and comfortable, we understand that dogs aren’t for everyone. For these patients, our staff would be happy to limit exposure. Please let us know if you have any concerns prior to your visit, or when you arrive. We have many patients with an allergy to dogs who are not symptomatic while in our office. Creating a relaxed and safe environment for patients is important to us. Sonny is well cared for, and is current with all required vaccinations and health requirements. Additionally, the CT ENT office is sanitized daily.